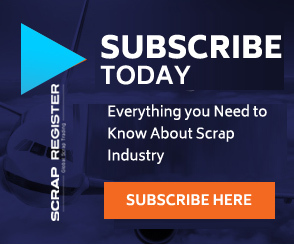 MUMBAI (Scrap Register): India’s major brass and copper scrap commodities prices continued to fall on the Scrap Register Price Index as on Monday, in line with weak trend in copper Futures prices at India’s Multi Commodity Exchange mainly due to the concerns over U.S.-China trade dispute and slowing global economic growth. India’s major brass and copper scrap commodities prices including brass huny scrap, brass shell 40mm, acr copper coil 3/8cc rod lme, copper armature, copper cable scrap, copper cathod lme ++, copper mixed scrap, copper pat, copper shell 40mm, copper super d.rod, copper wire scrap and electrolytic copper strip 25mm dropped on the Scrap Register Price Index as on Monday. The most active February copper contract on India's Multi Commodity Exchange has dropped by 0.78 percent to Rs. 439.30 per kilogram on Monday from previous close of Rs. 442.70 per kilogram. Copper Futures at MCX touched an intra-day high of Rs. 442.10 per kilogram and an intra-day low of Rs. 437.45 per kilogram during Monday. However, fall in Copper prices was limited as compare with other metals as prices are widely expected to strengthen as inventories stay at relatively low levels and as downstream demand would pick up after the Chinese New Year holiday.